In 2013 the author Tracy Chevalier published a novel called The Last Runaway. Set in the 1850s, it tells the story of a young Quaker girl who leaves Dorset for America with her sister. During the hazardous journey her sister dies, leaving Honor to make her own way in an unknown country. One theme of the book is the underground railway which helped slaves to escape to freedom. Another theme is quilting which was such a feature of American domestic life. In order to immerse herself in her book’s subject matter, Tracy Chevalier taught herself to quilt and soon discovered a passion for sewing. She went on to curate a quilt show in Bexleyheath and, as a result of that show, was contacted by the charity Fine Cell Work which teaches needlework to prisoners in UK prisons. They invited Tracy to speak about her book and her quilts, and this led to 63 prisoners from Wandsworth prison working with her to design and make a quilt with the theme of sleep, each creating a ten-inch square for the finished quilt. The finished quilt represents every possible emotion, together with the hopes, fears and dreams of those who created it. A book called ‘The Sleep Quilt’** has now been published, funded by many individuals who believed in the value of the project. It contains images of the squares and the words of those who sewed them. We often think about learning a new skill or taking up a new hobby at the start of the year. Tracey Chevalier did, discovering something hugely pleasurable and rewarding for herself, which also turned out to bring help and new life to those who needed it most. 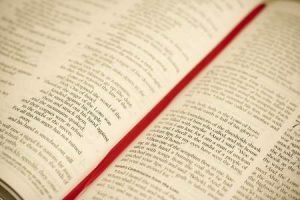 Our Bible study groups are meeting again in the New Year. We are very friendly groups and you are welcome to join us at any point. The Branscombe group is continuing to meet at 3 Mill Lane from 2.30-4.00 pm, with the first date Friday 19th January and further dates to be confirmed. Phone 22303 for details. The Colyton group meets on Thursdays from 7.30-9.00, dates 11th and 18th January, and February 1st which is to be confirmed. The venue will be confirmed. Phone 551400 for details. The Musbury group meets on Tuesdays from 7.30-9.00, please phone 553180 for details. Children’s event are continuing in the New Year, with Messy Church for Primary age children with their families meeting again at the Reece Strawbridge Centre from 4-6 pm on Sundays 14th January, 11th February. In March Messy Church will meet on Good Friday, 30th March, from 3.00-4.30 in St Andrew’s Church Colyton. Then the next session back at the Reece Strawbridge Centre will be as usual on Sunday 13th May from 4.00-6.00. Noah’s Ark babies and toddlers is meeting at a new time, 1.15-2.45 pm, which we hope will suit those who then have to pick up from school. Noah’s Ark continues at the Memorial Hall in Colyford on Thursdays 4th and 18th January, 1st February and 1st, 15th and 29th March. Bring and Share Supper as usual – tickets and food list will be at the Village Shop after Christmas. Our thanks to Geoff and Rachel. We will be happy to welcome Rev Barry and Mrs Judy Brewer to the party as our guests and look forward to enjoying Barry’s songs and music for our entertainment after supper. Messy church were busy making the Christingle oranges surrounded by the Christmas tree festival in St Andrew’s church. It’s a beautiful sight when finally all the lights are dimmed and the candles are lit! Life on the road isn’t always easy: danger averted! There will be a Confirmation Service in our Mission Community on February 25th 2018 in Branscombe church, and the Bishop of Exeter, Rt. Revd Robert Atwell will be here to confirm our candidates. We will be starting confirmation groups for adults and young people in the New Year. If you would like to find out more about the Christian faith or what it means to be confirmed then please speak to Hilary or contact her on 01297 553180 or by email (see contacts page). The last cafe of 2017 will be on Tuesday 19th December. There will be no cafe on 26th December and 2nd January. The first cafe of 2018 will be on Tuesday 9th January. Christmas preparations in Holyford Mission Community are gathering pace, including decorating trees for the Colyton Christmas tree festival. What else are we looking forward to? 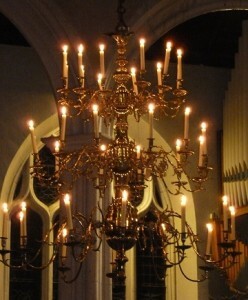 IMG_1136 from Holyford Churches on Vimeo. Posada is a Mexican Christmas custom, and the word means inn or lodging. Each day during Advent, figures of Mary and Joseph are passed from house to house around the parish, finally arriving in church on Christmas Eve. 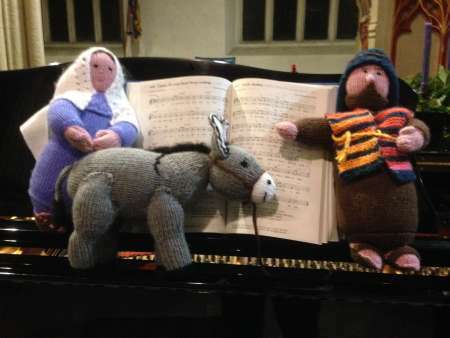 The latest sighting of our Mary and Joseph with their faithful donkey was earning their keep at Colyton Pharmacy. We hope they make it to the church in time! 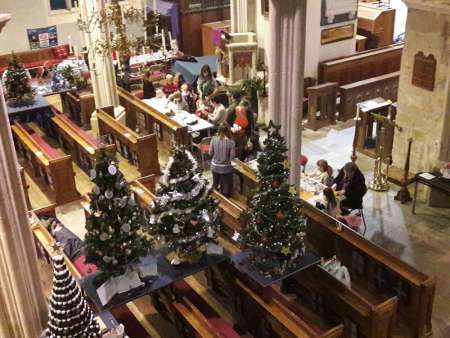 Carol services are taking place in all our churches, and there is also carol singing around some of the villages. All are most welcome! For full details of all Christmas services, please see the Christmas leaflet available on the home page. The festival is taking place again, from 6th-10th December.